everyone, here’s something to think about. Right now, an heir with $500 million in yachts and fine art and a public school teacher with no savings can pay the same amount in federal taxes. The reason? Because people pay federal taxes on their income, not on their wealth. So if that heir and that teacher both make $50,000 in a year, the federal government sees no difference between them. This isn’t an oversight, it’s on purpose. It’s because the rich and powerful run Washington, and they make sure the rules are written to benefit themselves. The top 0.1% of American families — the richest 1 in 1,000 — now have nearly the same amount of wealth as the bottom 90% of American families combined. Meanwhile, for everyone else, opportunity is slipping away. This is bad for our society, bad for our economy, and bad for our democracy. We need structural change to fix it. That’s why I’m proposing a tax on the wealth of the richest Americans. It will only affect the tippy-top 0.1% of the wealthy, those with a net worth of over $50 million. I’m calling it the “Ultra-Millionaire Tax,” and we can use the significant revenue it creates to start rebuilding our middle class. A lot of rich and powerful people won’t like it, but I don’t work for them. We’ll only get this done if this grassroots movement demands it. Sign our petition if you agree: It’s time to tax the wealth of the top 0.1%. Experts say that this tax would generate nearly $3 trillion over the next 10 years. That money could help people and grow the economy in a pretty big way. How? Here’s one idea: We could use that revenue for universal childcare and make sure every parent has access to good, affordable childcare and every kid has access to early education. Or, here’s another: Create a path to student debt relief for the millions of young people getting crushed by student loans. That’s how we make structural change so our economy works for everyone, not just the people who can afford to hire armies of lobbyists and lawyers. Our tax laws have been written by the wealthy and well-connected to benefit the wealthy and wealth-connected. But not for long. We’re building a grassroots movement to return power to the people. 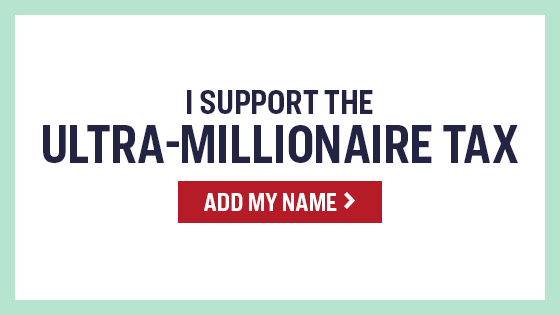 I’ll keep fighting for the Ultra Millionaire Tax — but I can’t do it alone. Add your name if you believe in making sure the rich pay their fair share. Paid for by the Elizabeth Warren Presidential Exploratory Committee. Does not equal endorsement.